Yesterday, figs were one of the healthy foods featured on the list of immunity boosting foods that I blogged about. One of my favorite way to eat figs is to combine them with dark chocolate (which is also a very healthy food to eat due to its high antioxidant content). Lucky for me, a company called Figamajigs not only makes yummy chocolate fig bars (which I blogged about previously), but they also make a pretty low calorie fig candy that is a great, all-natural, healthier substitute for candies like M&Ms. 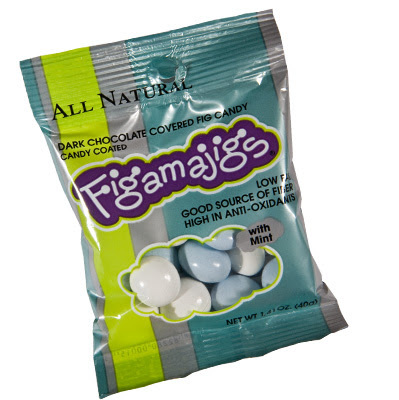 These figamajigs candies come in a few flavors, some candy coated, some not, including: dark chocolate, dark chocolate with candy coating, mint flavor, and mint flavor with candy coating. My favorite by far is the mint flavored candy coated (which is pictured)! The figamajigs are just liked you'd expect. They have a chocolate exterior and a fig interior. Because of the figs, the candies actually have fiber in them, namely 2 grams of fiber per serving. Overall the whole bag (which is 22 pieces) has 150 calories, 2.5 grams of fat, 2 grams of fiber, and 1 gram of protein, so 3 weight watchers points (this is for the chocolate mint candy coated flavor, the others might vary). They make a perfectly satisfying & delicious low calorie snack-- one of those snacks that tastes like a splurge but really is within reason. And, if you don't want to eat them for a snack, you could also consider sprinkling a few on your low calorie ice cream, steel-cut oatmeal, or your favorite low calorie cereal for a delicious dessert! I buy Figamajigs at Whole Foods or Mollie Stones, but I see they are also available at stores like Target. They also have an awesome store locator on their site. I've had the dark chocolate, non-candy coated and they are delicious! I didn't know about all those other flavors though - cool! wooooooo.22 for 150 cal? that's good deal!!! so healthy and so low-cal for dark chocolate! oh...by the way, where can I get them? I can not, for the LIFE of me, find any kind of "candy section" at Whole Foods. What aisle or area did you find them in? The only place I found that was the aisle with all the power/nutrition bars and such. And I checked the mini "candy stands" at the checkouts but no luck. *sighs* Perhaps I'll try Target, but I doubt I'd be lucky there if Whole Foods didn't carry them. these look great - I need to spend about 4 hours in whole foods looking for all the products I want to try! Hey Emily - try the aisle with the full-on chocolate bars (like Dagoba, etc.). Things like this tend to be on the lower shelves. You could also try the figamajig store locator if that doesn't work. I hope you find them!